Deluxe Spa Pedicure is a cosmetic treatment to the feet and toenails. While you sit in a Luxury relaxing massage Pedicure chair , we remove the nails polish and cut your nails then file them. Apply cuticle softener to the base of the nails and soak your feet in hot warm water with sanitizes sea salt. With the sanitized tools, push the cuticles back and use cuticle clipper to remove all the excess cuticles and skin. After with a buffer, softly buff nails and make them shiny. With a mice stone or foot file, scrub away dead skin on the bottom feet and heels. Massage from knee down to feet with lotions. 6. Excess massage from knees down to feet with a Minerals and European sea salts mildly exfoliate while a blend a natural oils penetrate deeply into the skin to soften, moisturize and remove dead skins. 7. Apply natural lotion (with aloe vera) from knees down to feet will moisturize and smoothen your skin. 8. Wash your feet with clean and warm water then clean, wrap around feet with hot towel. 9. Apply base coat to the nails, (Base coat contains protein, aloe vera, vitamin E, and calcium. These ingredients add strength to the nail.) then apply two layers of your choice OPI nail polish color. Finishing with a top coat layer to protects the nail from chipping or peeling and keep it shiny. 10. Hot Cappuchino /Coffee/Tea (Tassimo & Keurig Coffee Brewing machine) or Spring water included. Our Luxury pedicure chair Features: Shiatsu massage system (Human Touch) Fiberglass with Acrylic coat gel resin, Chemical and acetone resistance spa shell, Thick and Elegant Glass Bowl CleanJet pipeless system, Quiet Whirlpool Motor Capable of Floor Drain, Automatic Power slide and recline , Adjustable Up/Down armrests, Pull out Spray, Durable leatherette with protective finished, Acrylic reinforced with Fiberglass and Gel Resin. 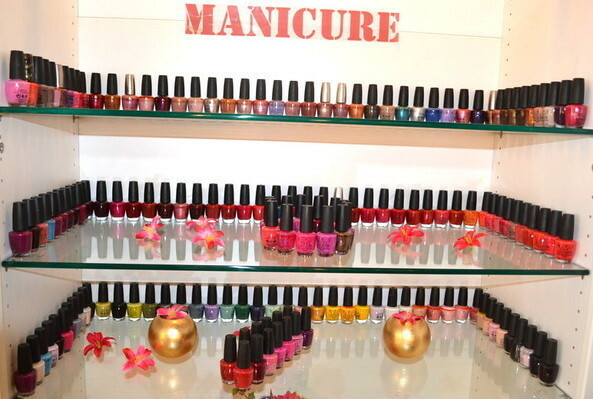 There are 500+ OPI nail polish, shellac in our nail salon for you to choose from.